Over the past couple of months, I’ve been switching up my skincare routine and trying out some new products, so I thought I’d share my thoughts. So, to take my makeup off initially, I use the Garnier Micellar Water, which I’ve been using for a couple of years now. It does such a great job and doesn’t irritate my skin at all. After that, I go in with my trusty Glossier Milky Jelly Cleanser. I am obsessed with this stuff as it feels so gentle and has such a gorgeous subtle rose scent, which I’m sure so many of you are familiar with. My skin seems to love this cleanser so I think it’s going to be a staple in my routine from now on! After cleansing, I like to go in with a toner. When I was in London a couple of months ago, I popped into The Ordinary pop up shop in Shoreditch. I’d heard great reviews about their Glycolic Acid 7% Toning Solution, so I decided to pick it up. Plus it was only £6.75, so I couldn’t really go wrong. I just pour a little bit of this onto a small cotton pad and gently wipe it all over my face. It’s incredible at removing any excess makeup/dirt from the day, even if it does sting a tiny bit sometimes. At this point, I usually clean my teeth whilst waiting for the toner to sink into my skin properly. Once that’s settled into my skin, its serum time. The one I’ve been using for a while now is the Klairs Rich Moist Soothing Serum*. I’ve loved using this in the warmer weather as well, as it just feels so cooling on the skin. Although I have a combination/oily skin type, it’s also a bit dehydrated so this really helps to fix that problem! Whilst this is sinking in, I also pop a bit of the Botanics Hydrating Eye Cream* on. I never used to bother with eye cream, but I suffer from quite dark circles so decided it was about time to use something on them. I haven’t noticed a massive difference I must say, however it definitely calms my eyes down when they’re a lil bit puffy. Finally, a product I’ve been waiting to talk about on the blog for ages – the SOS Solution For Scars*. I’ve had my fair share of breakouts over the years and I’ve been left with some scarring on my cheeks/chin which, to be honest, I wish wasn’t there. I’ve been applying this cream morning and night across the areas where most of my scarring is and I have to say I’m starting to see a subtle difference. The scars I have are quite dark/red from spots that I popped or picked at (oops) and I’m surprised at how well this has reduced the redness from them. Don’t get me wrong, my scarring hasn’t all gone yet but I am starting to see a difference and I’m hoping the longer I use this, the more it’ll continue to fade. Another product I like to use on pesky spots is the Mario Badescu Drying Lotion. This stuff really is a miracle in a bottle I’m telling ya! Whenever I have a breakout or the odd under the skin spot, I’ll pop some of this on and overnight the spots are visibly reduced – it’s amazing! 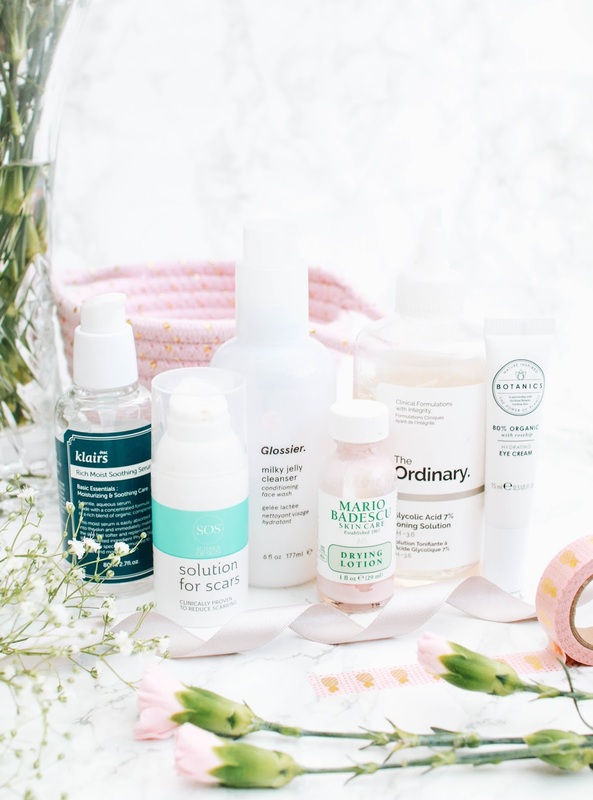 Sorry that this post was so rambly, I just love talking about skincare and it always intregues me to know what other people use in their routine. If you have any recommendations for combination skin I’m all ears.